Sarah Rees Brennan’s Unspoken is unequivocally one of the best young adult books I’ve ever read. I don’t even know where to begin. Is it enough to tell you to read it? Synopsis aside, this is as colourful, as unique, as moving and absorbing as a book can get. The plot involves a strange family, a old-town legend, murder, love and magic. Brennan envisions an original premise that holds your attention from the very first page. Her idea is fully developed, never giving too much while holding nothing back; the details rather come as they may. The pace is a leisure walk through Kami’s everyday life, with curious bursts of the real mystery surrounding the return of the infamous Lynburn family, feared and revered as local gods. It is arguably slow, but readers are not left impatient because Brennan never fails to deliver quality. The air in which Brennan has enveloped her tale is chilling. It is a gothic atmosphere: a mansion filled with embellishments of a single motif — a human hand and the profile of a woman drowning; and a forest with lakes and rivers called the Crying Pools and the Sorrier River. The setting is laid out perfectly — visually rich and stunningly visceral. The writing is sensational. But let’s skip how well she is at building tension, or shaping characters so entire both in body and temperament, or crafting scenes within which your most intimate emotions are dragged right along with the characters’ distress. What I applaud her most for is the brilliant way she’s conceived and actualized the concept of a girl hearing a voice in her head, without slipping through all the potentially tricky, subtle holes of reason. Brennan balances between Kami and Jared the inevitable confusion and frustrations that come with being mentally and emotionally invaded and the the genuine love formed, reinforced, and reciprocated time and time again since the day they were born. These are fine, fine lines and Brennan pulls them off heroically. The scheme of it could’ve been a grand failure. But Brennan is expert; she has thought this through and it shows. I knew every word and every confession that went through Kami’s head. Her situation is different but so intense and her inner battles so well-written that I I felt like I knew how it felt. But obviously, I don’t! I have no clue what that would feel like, to be able to read someone else’s mind and have them read mine; the bombardment and lack of privacy; the severe complications that could erupt from a single, careless thought slipping through one mind into the other. But she was so good she convinced me I did. The trick is that while it is imaginary, Kami’s situation is also inescapably bound with the conditions of the heart. Kami’s emotions are readily accessible, they are emotions we are familiar with. On top of that, the cerebral connection between Kami and Jared was executed flawlessly. It was like a dance, smooth and effortless — we don’t quite know but we understand. It had such a nature of its own that it felt like an intimate, long-ago sensation; like an old, forgotten skill remembered. Now, this cast has got to be one of the most memorable group of characters I have ever come across in young adult literature. They are all strong, present, and original. They do not fall prey to cliches, stereotypes, or pigeonholes. From Kami, to the Lynburns, to the dead grandmother who makes not a single appearance in the story other than in Kami’s memories, they are each individually compelling. Angela, Holly and Ash, as the supporting characters, do more than support. They season the narrative with cool humour and badassery. Jared, as our male lead, is troubled. He is unstable, unpredictable, and you’re not quite sure whether to like him or not. But he is the hero, albeit somewhat a tragic, agitated one. His emotions are extreme and passionate, but he is also so desperate that you give him your sympathy, then eventually your heart. And before you know it, you love him as Kami does. How dare you resist such a creature? Kami is a character we can have faith in. Often we doubt our protagonists, waiting for the moment they fall for the lie or surrender to the threat. But in Kami we trust: that she will always do what she feels is right. She is hilarious, introspective, unyielding and soft. Her resolve will not be wavered by anyone. Anyone. The relationship between Kami and Jared is interesting in that it progresses in reverse to typical young adult romances. They begin bound to each other and through this, they form an unbreakable bond of affection and trust. But as their worlds collide, their path takes a turn you do not expect. Their feelings for each other are layered, cutting, and sincere. It is gut-wrenchingly sensitive and romantic. But also complicated. Their link does not instigate or fuel mindless lusting and turn them into a meaningless catastrophe. Brennan throws obstacles so that nothing comes easy. And it’s not. In fact, it is downright excruciating. Are these words enough? Have I done my duty? All I will say is that Unspoken is a novel that will leave both your imagination and your feels satisfied. Dangerous chances are taken, real things could be lost. The stakes are high because Brennan risks the thing that matters most, your self. We posted this on Facebook last week, but just a reminder that if you’d like a little taste of Kami and Jared’s world, don’t forget you can read the free short story “The Summer Before I Met You” online. I really did love this book. I didn’t know what to expect when I started it but Kami impressed me. She is one of my favorite female leads. I think it’s her determination that gets to you. She focuses on her goal with a single minded determination, nothing could set her off the track. I am in love with this story and these characters. They are all so much their own. And it is so excruciating! So much so that I was crying by the end. Great review! You’ve convinced me to read this from your review. I was unsure at first (the cover looks a bit young), but who am I to argue with 5 shooting stars? Beautiful review Wendy <33333333333333333333333333333333333333 yay! Mmmm… From you? Actually, yes. You seriously are one of the few reviewers I’ll take it on total faith from. Seriously, I’m going to keep repeating it until it’s proven. I really cannot wait until the release of this novel. 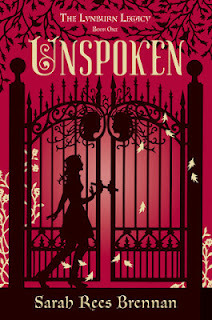 So many people have said wonderful things about Unspoken, I can’t wait! You have me sold on Kami, I’m so bumping this up on my TBR list. Plus the cover is gorgeous! Very beautiful review. It sounds really good book and Kami seems very interesting character. Aw, thanks Kristine! Yes, go and get this now!! Unspoken was a beautiful surprise to me. I never read anything by this author, but now I want to dive into the Demon Lexicon series. I promised Sarah my store will stock her book and I intend to keep that promise. Would you tell her that, Wends? I have this one as well on my “to-read” list, K. I might have to bump it up to the top if you gave it a sparkling review. Loved this review and the book sounds fantastic! Can’t wait to get started! Sounds awesome. The characters sound amazing and creative. Can’t wait to read it. I’m going to be honest, I hadn’t heard of this book, and am not sure I’ve ever read anything from this author, but it’s now totally on my must read list. Excellent review! You’re in for a really great ride! Have fun! Everyone has been giving heaps upon heaps of praise for this! Ah, the pressure to read this ! I’m glad that line didn’t put you off. Sometimes I don’t like being vague, if that describes it…bit I’m happy you got my meaning :D And yes, I think you’d really like this. Oh yay! This book finally came out! I have been reading reviews of it for weeks, dying to get my hands on it! I hope this doesn’t let you down, Vivien! Holy moly, K, this is such a fantastic review! I’ve been hearing the best things about this book but I’m a bit wary since I know there is a cliffhanger. If it pops up at my library though, I’m definitely going to give it a shot. I have been fangirling about this book since a read it a few moths ago and I am so glad it’s out in the world!!! I agree with everythig you said. It was phenomenal. The ending killed me, though. I’m still upset! Hmm, I passed on this book cause I didn’t think it was for me. Maybe I was wrong. Thanks for sharing. Well, I hope it delivers, Savannah! I read this today, and I could not agree more with this review. What a gorgeous novel. Man. I didn’t know it was the first in a series (why would I not assume that at this point? ), though, so the ending bummed me out a bit. This is my first Brennan novel. Definitely won’t be my last, if you couldn’t already tell. Thank you for following, Carmen. Please read this book. It’ll make you happy. I was impressed too, Gina! YAY! I’m so happy to know this is great! I love SRB, and I am wondering what to read next :) This will be pushed upwards on my TBR for sure. wow 5/5, I didn’t know what to think about this one but I think I was wrong to not ask it now. thanks for the review! I’m a new follower, gorgeous site! Angela and Holly are two of my favorite supporting characters-I love the people-hating nap-loving Angela and how Kami comes to appreciate Holly after isolating her all those years. I don’t think Brennan and I quite click as an author-reader pair but I greatly admire her way with words and story. OMG I don’t think I’ve ever seen you gush so much about a book. I’m impressed. I’m definitely going to have to read this one. A fantastic review you hit all the essentials without spoilers – thank you! Your welcome, Dannielle. Read this now! I would stalk the postman, yes, Keertana. Nothing is too much for this book because it is worth every single page. I really, really hope you enjoy it as much as I did. This book has so much feeeeels! I think you’ll really love it, Wendy. It has everything I look for in a book!! I agree with your review 110%! I hadn’t been expecting terribly much from the book because I was unimpressed with the author’s other novels, but wow. Just wow. And that ending! htbsutinviuhub. Can’t say anything but gibberish about that. Reading this book as a galley was one of those moments where I hated being a blogger. When reading book one six or seven months before its own release date, the wait for book two becomes so much harder. Yay! This book just blew me away and I hope it does you as well. Love that you loved this book so much. It really shines through in your review. I’m having a different experiencing with it. I’m maybe half way through and can’t really get into it at all. I’m hoping that it’ll pick up for me. At the moment I’m finding it a little too slow paced and I’m finding the characters difficult to connect with. You know I’ve been waaaaiting for this review! I was already looking forward to reading this book, but I am bump bump bumping it up the pile now. I’m convinced. you had me at “Unspoken is unequivocally one of the best young adult books I’ve ever read,” but I read on. great review! I’m eager to read this and pass along your review. You’ve made this book sound amazing – it’s become one of my must-reads now!